We know the life of the recruiter is no easy road. Securing top-notch talent is harder than ever, and the relentless pressure to get the best-of-the-best does not let up. Our research shows that 83% of recruiters say that talent is the #1 priority in their organization, and 56% expect their hiring volume to increase. For many years, recruiters pursued passive candidates with the goal of enticing them with the opportunity of a lifetime, or had active candidates come to them looking for work. But the reality is, most people don’t generally fall into the “active” or “passive” category exclusively. There is the idea of “open talent,” somewhere in the middle of the spectrum where most of us fall. There was a great a joke made on the HBO series Silicon Valley where one of the main characters signaled on LinkedIn that he wanted to leave the fictional startup. Within seconds, he was hearing from recruiters. This is exactly the experience we want each and every one of our members to have. 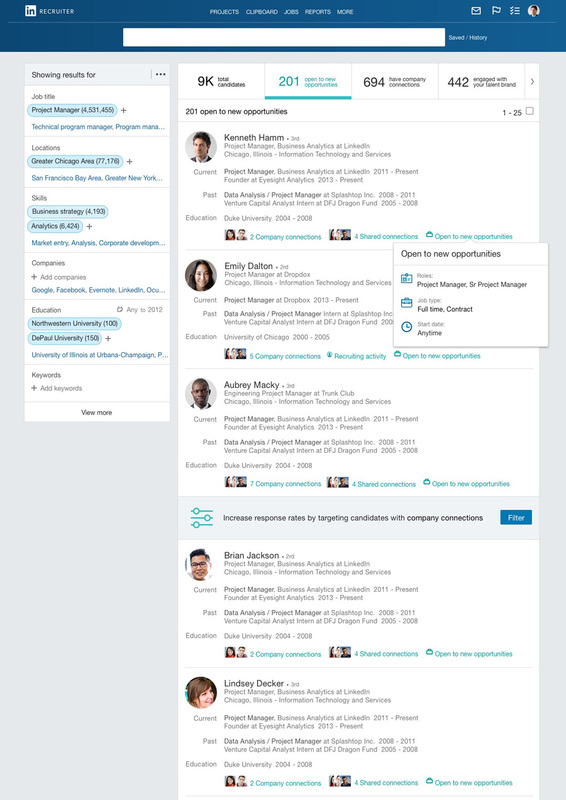 Now through Open Candidates -- a spotlight feature within our Recruiter product -- we’re making it easy for LinkedIn members to privately raise their hand to say “I’m open to being recruited” for the first time ever. We currently have nearly a million members signaling they’re open and expect that number to grow significantly as we expand markets through 2016 and beyond. To date, we’ve rolled this out in the U.S., Canada, Australia and the U.K. For a deeper dive check out our featured-focused blog post here. In the same vein, we want recruiters to be able to find candidates who show their interest by starting the application process even if they don't complete it. There are no shortage of reasons that applicants get distracted or feel discouraged, ranging from cumbersome mobile application process to lengthy questionnaires. As many as 74% candidates don't finish the application process on company career sites. We are launching Apply Starters to combat this issue by giving members the ability to share their profile with recruiters when they start applying. This will give recruiters access to at least 2X as many candidates for their jobs, and those candidates are 4X more likely to respond to outreach from a recruiter. That said, having greater access to talent isn’t enough for recruiting them, especially if the company’s brand awareness is low. This is where LinkedIn Career Pages comes into play. We piloted LinkedIn Career Pages with more than 30 charter customers including Apple, Shangri-La Hotels and World Vision, and what we’re seeing is promising. Early results show LinkedIn Career Pages visitors are engaging more with content and viewing jobs with 60% increase in pageviews per-visitor, and 175% increase in the number of job views. LinkedIn Career Pages is launching globally and more feature details can be found here. Lastly, in our effort to create greater efficiency and productivity for recruiters, we are introducing Recruiter System Connect, a reimagined way of how Recruiter integrates with customers’ Applicant Tracking Systems. This integration saves time by reducing the need to toggle back and forth between systems to access candidate information, and makes it easier to seamlessly collaborate while getting the most accurate and up-to-date information on any candidate. Our mission is to break down the walls that stand between job seekers and recruiters, and give companies the insight they need to attract the cream of the crop. We continue to be motivated by this mission, and look forward to sharing more news as we make progress on our goals.